Oftentimes, potential thieves don’t eye the window or front door when they size up a home to burglarize. Instead, it’s the garage door. But with the right security measures, you can rest assured your family and belongings will be kept safely inside. The first and most effective way to keep thieves at bay is to track down every garage door opener you have and replace them. If you have a garage code number pad located just outside your door, regularly reprogramming that code is also a great way to secure your home. Plus, homeowners can now opt for a miniature remote opener to keep in their bag or pocket rather than leaving one in the car or hidden outside. Next, make sure your garage is well-lit. This includes installing exterior lights that stay on at night or lights that are triggered by motion on the side of the house where the garage door is. This can also go for inside the garage, where switches already sit ready by the door to enter the house itself. Turning that light into one that senses motion will significantly increase security and safety in the long run, even if it’s not a thief moving through the garage space. Hands-free motion sensing lights can also make it easier to move things in and out of a garage, since you won’t have to worry about hitting the switch. If you’d prefer to manually use your garage door during times of high vulnerability, you can simply turn off the electric power source to any door by unplugging it. Garage doors are heavy and difficult to lift, and if the only way in is by doing so, adding a lock to an already weight-loaded door can easily withstand any attempt at burglary and stop thieves in their tracks. If your door is outdated or damaged in some way, it’s probably best to replace that door with an updated one. This naturally increases security, as technology improves with newer models. 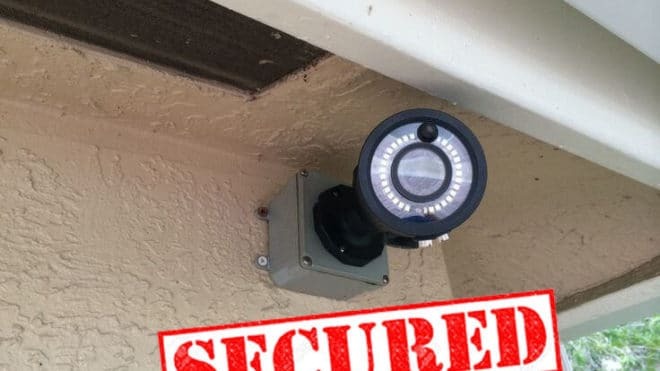 You can even bring your security measures inside the house with cameras and sensors that can tell you when your garage door is opening and/or closing. This offers more peace of mind for homeowners who may not be able to hear the door from inside their house. Call Above the Rest Garage Door today for tips on how to repair and update your garage and feel secure in your home.